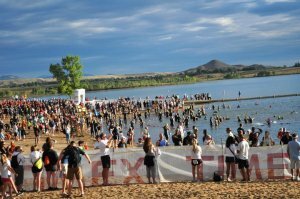 Triathlon mecca of the United States (and home of TrainingPeaks) Boulder, Colo. holds the IRONMAN 70.3 Boulder on Aug. 4th this year. 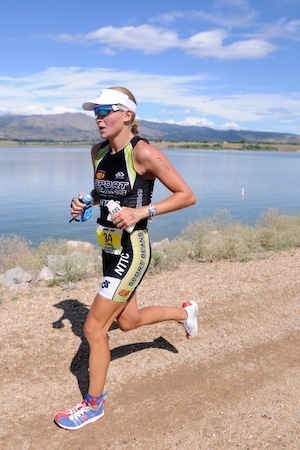 With the picturesque Flatiron mountains as a backdrop, athletes will swim in the Boulder Reservoir, bike along a fast, rolling course and run along the dirt roads and paths surrounding the reservoir. With a new, single loop bike course, this race promises to be fast, but it’s not easy. Many athletes worry about the altitude, but it is the dry heat, lack of shade and rolling profile that make this course tough. Here are a few tips that will help you achieve your goal on race day. 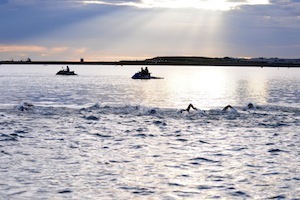 The swim consists of a single counter-clockwise loop. With water temperatures ranging from 70 to 74 degrees, be prepared for a non-wetsuit swim. The sun will be right in your line of vision as you swim out, so bring dark goggles. Work on better body position in the pool as you won’t have the help of the wetsuit to keep you afloat. Doing the Superman and Side Kick drill can help you keep your legs up and work on balance. Swim on your stomach with both hands out front, like you’re flying. Kick for propulsion while focusing on keeping your core tight and legs high. Breathe to the side or by lifting your head straight up, being careful not to let your legs sink. Swim on one side with your lower hand out front, ear resting on your shoulder. While kicking, keep this position and focus on your balance. To switch sides simply take a stroke and assume the same position just on your other side. The run to the bikes is a slight uphill on grass about 50 yards long. It’s not steep, but coming from the water your legs will be a bit rubbery. You will have plenty of time to get your wetsuit unzipped and be ready to ride. New for 2013, the bike is now a single loop that winds northeast before turning back and heading southwest back to the reservoir. Though in the past the Boulder 70.3 course has been known as “flat” this course is actually deceptively hilly, as there are no big climbs, but with plenty of rollers the course is rarely flat. Pacing your effort from the start will be crucial. If you have a power meter, knowing your Functional Threshold Power (FTP) is key. If you don’t have a power meter, you should know your Lactate Threshold Heart Rate (LT HR). FTP and LT HR refer to the effort you can maintain for a 1-hour, all-out time trial. According to Joe Friel, for a 70.3 event you should be looking to hold 80 to 85 percent of those values throughout the bike. When you spike your watts or effort, it is called “burning a match“. Every athlete has a few matches to burn, but burn too many and you’re “burnt”. A match is burnt when you hold a certain percentage over your FTP or LT HR for a given time. For instance, holding 20 percent over your FTP for one minute is a match, as is holding 8 to 12 percent for 10 minutes. 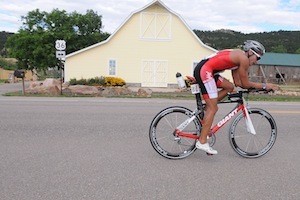 In the case of Boulder 70.3, the hills are short, so watch for any spikes over 20 percent of your FTP. For those without a power meter, this can be tricky because it takes time for your HR and Rate of Perceived Exertion (RPE) to catch up with your actual effort. However, as a guideline, do not let your HR rise over 20% of your LT HR, and don’t let your RPE go above 8 on a scale of 1 to 10. Beginning from T1, the first four miles are a false flat to slight uphill. Keep the pace in check here or you run the risk of cooking yourself early. Highway 36 has some big rollers and you may spike your effort here a bit just to keep moving but watch out for burning too many matches. Once you start heading northeast on the country roads the terrain is gentle, but any wind can make it difficult. Miles 15 through 35 take you through some beautiful country roads that continue to undulate. County Road 21 and 95th Ave have some big rollers in there, and if you’ve overdone it early, these can start to really tax the legs. If you’ve paced well you should be able to power over them. Once you’ve crossed Highway 66 (it will be marshalled but it is a busy road so be alert) the terrain levels just enough. Again, if you have it in your legs you can push the pace here and see some of your highest sustained speeds. Along 75th Ave you can sustain a high speed while giving your legs a bit of a break if need be. There are not many places to rest on this course, but this stretch is one of them. If you feel like you’ve pushed too hard, this is your only chance to recover. You can also let your heart rate come down and take in some nutrition. The last stretch along Highway 119 can seem like forever, but soon you’re turning back to the reservoir and hopefully you’re ready to run. Since the course is new we didn’t have any past power files we could use. So, in the interest of this story and for your sake, I went and pre-rode the course. I have a FTP of 300 watts, so I was looking to hold 240 to 255 watts. As you can see, I averaged 250 normalized watts, right at 83 percent of my FTP. In the early miles and especially along Highway 36 I kept my effort in check and held back my urge to hit the rollers hard. That paid off for me along the country roads and I was able to keep my power consistent in the final miles. You see that my peak 20 minute power came at miles 19 through 25 and my peak 30 minute power was at miles 41 through 53. Notice also that the T1 and Highway 36 selection has a normalized power of 250, exactly what I ended up with for the entire ride. These three points show consistent pacing. Had I gone harder in the first miles I likely would have dropped my power numbers in the latter miles. Instead, I built my effort. I also believe that psychologically it helps to be passing others in the latter stages rather than being passed. You can build your FTP in multiple ways. One of the most popular workouts for building your threshold is to do 2 x 20 minutes at 88 to 93 percent of your current FTP with 5 minutes of rest between. This simple and relatively short workout offers a lot of bang for your buck and will have you ready for race day. With no shade on the course it will be worth your time to apply a second layer of sunscreen during T2, and certainly wear a hat or visor. The run is 90 percent dirt road/trail and consists of two loops around the reservoir. It’s also very flat – the course has only 197 ft. of elevation gain. That doesn’t mean it’s easy. There is little to no shade on the course and typically temperatures reach into the high 80’s and even 90’s. If you don’t watch your hydration on the bike, it will catch up to on the run. As always, proper pacing will also be a key here. For those not acclimated to the hot, dry climate, start the run moderately to allow you to get in more nutrition at the start. Once you feel you have adequate hydration and sodium you can start to ramp up the pace. Like the bike, having a goal pace to work with is key. In training, do a race simulation where you bike 45 to 60 miles at near race intensity, then run off the bike for five to eight miles at high zone 2 to low zone 3 heart rate, or an RPE of around 7. The pace you hold for this is a good marker for your goal pace on race day. It is also worth noting that with 90 percent of the run on a hard packed dirt surface, your pace will be a bit slower than it is on the road. This feels nicer than concrete, but expect your pace to be five to ten seconds slower per mile than if you were running on pavement. Your goal pace should reflect this. As you know, Boulder is at an altitude of around 5430ft. and many worry about how that will hamper their race. Since you won’t acclimate in a week, plan on arriving in Boulder two days out. Second, the biggest effect altitude will have is as you inch towards your redline. It will come a bit sooner than normal, so don’t panic when you feel it. Additionally, if you go over the redline it will take you longer to recover. This reinforces the need to pace yourself steadily and appropriately throughout the race. More than the altitude, the climate will catch a lot of non-locals off guard. Boulder has a hot and dry climate, so even though you don’t feel like you are sweating you certainly are. Be sure to have an adequate hydration/sodium strategy that reflects this type of climate. More than anything, having a race day plan in place that you feel comfortable with and know you can execute will bring you success. Knowing your key metrics like FTP or LT HR will allow you set up a well-defined plan that will get you to the finish. Smart planning leads to smart racing, and that ultimately leads to success.